​One of our clients recently approached us to ask if we could help them with some after-sales communications. It's simple enough, capture the referrer at the time of the sale, which we can do, and then create a letter and email/snail mail it out to the referrer. Our client uses an excellent CRM for their business. It's a niche product, designed for their industry and it has a lot of bells and whistles, most of which our client does not use. They're paying good money for it too. The upshot is that they're not using the CRM as it was designed to be used so we're going to need to set it up for them. This situation is not unusual in this client's industry. The majority of startups in their industry learn the hard way that starting business is more than just a matter of printing some business cards, getting an online booking system and voila! you're raking it in. My experience tells me that the people new to this particular industry sometimes fail to understand their sales and administrative processes (they're not traditionally trained in that aspect of the business) and they end up making costly mistakes that potentially keep them in the start-up phase for way too long. ​1. Understand your sales process. Know where your clients are coming from. Maybe you shouldn't be targetting those people directly. It's your referrers that you have to target and build relationships with. If you are targetting your clients directly, you need to get inside their heads and almost know what they're thinking. Your marketing has to hit their pain points. Know where your clients "live". Now I don't mean you need to know their address, but you do need to know where they are spending their time, because that is where you'll put your advertising. Of course, I'm talking about social media platforms, publications that they read or what TV channels they watch. If you're a Business to Business provider, then you've got to get out there and network like a madman/woman. Build relationships and help others to get what they want. ​EG If you're selling goods online, make sure you get a robust e-commerce/fulfillment/inventory management system. Go for something that's integrated, rather than having to tack bits on and build connectors. ​If you're in Allied Health, get a practice management system, don't use a sales based CRM because you'll need to integrate too many plug-ins and add-ons. ​Err on the side of caution in the early days and record EVERYTHING about your customer in your CRM. You can cull it all later on. ​Even if it's just you doing the work, make sure that you quickly write down the steps of what you do. Keep this in a folder on your Dropbox or whatever file system you use (make sure it's something that's backed up!!). ​Even if you're just taking payments at the end of a consultation, write down how you do it. ​Make a checklist of the information you need to get from new clients - remember to collect as much information at the beginning as you can. You can always cull it later. ​Keep it simple. Too many businesses have complex intake processes which hinder their ability to scale quickly and slow the process of getting new clients on the books. ​I understand that all of this will take precious time. It will pay off in the long run though. Half the battle of delegating is documenting what you do. It's the one thing that slows you down - because you'll think it's just quicker to keep doing it yourself. Start with documenting the process as you create it so when the time comes to hand this over to someone else, you'll have it ready to go. 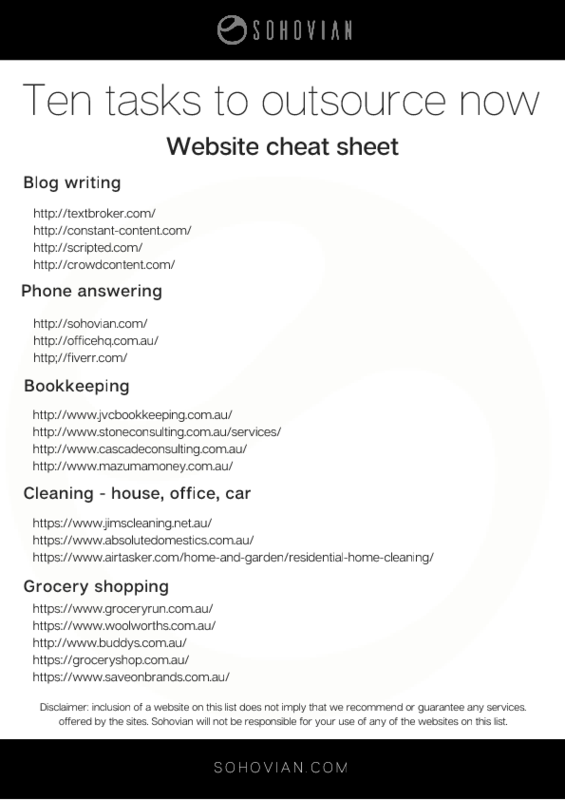 If you're thinking you need to look at outsourcing some of the tasks in your business, or your life, then download our "Ten tasks to outsource now" cheat sheet. We suggest ten things you can outsource now to help you in your business and the websites you can go to, to find people to do the work for you.